Enjoy village life near Bath, Castle Combe and Lacock. Stop here if you want a venue for a stag/hen or family stay where you don't want to worry about making to much noise or mess (within limits)! You may also want to be in a friendly village with 2 pubs where landlords Stuart and Joe serve up competitively priced food, drink and often free musical talent. Ex private chef Joe , who has cooked for the likes of Rupert Murdoch prior to running The Six Bells, can do breakfasts by prior arrangement as well as offering 10% off food prices for Trimnells guests. There are also 2 clubs that do drinks and music that welcome visitors for a small entrance fee, they offer country friendliness, and competitively priced drinks I might add. The village attracts people from the surrounding area and can be buzzing at the weekend. It is not unknown for the likes of Peter Gabriel and Nick Mason to visit 'Jigsaw' founder John Robison at his nearby home and wedding venue Euridge Manor. Celebrities often stay at Lucknam Park Hotel. Whether you see a helicopter landing or not, it may be worth a visit for their Michelin starred cuisine, often enjoyed by Nicolas Cage when he owned a house in Bath. I am told Robbie Williams enjoyed the pool in the past. Trimnells sometimes operates as a B&B (if its not booked for a holiday let) and we once had Kate Middletons parents stay here to attend a local wedding. They were turned away at the local pub for food because they were too busy and nobody immediately recognised them. That's how crazy it gets here folks! I could go on about the time a Texan billionaires daughter took over Lucknam Park Hotel for her wedding but that's another story...or how a guest bumped into local Ex Bath Rugby star Chris Lilley and went home with a team strip! Hopefully this gives you an idea of the ambience of the area. I will just mention that Colerne residents are known as Colerne donkeys. This relates to a story regarding the burial of a donkey in the graveyard with its hooves protruding. Don't ask me to explain, nor explain why there is no minute hand on the Church clock! Now to the blurb. I'm sorry if its a bit repetitive or the pictures are a bit blurred. Trimnells offers guests the chance to enjoy village life in a designated area of outstanding natural beauty. They can enjoy traffic free roads whilst being at the hub of nearby tourist attractions. They can walk to country pubs in a friendly unspoiled village just off the tourist track where visitors of all kinds are welcomed including many overseas visitors who have described Colerne as "a bit of old England". We think by this they mean that locals will greet you and talk in the street and pubs and whilst some upmarket villages can be snooty at times, this is not the case in Colerne. Local facilities include golf, clay pigeon shooting, quad bikes, go karts etc. On their walk to the pub guests may walk past the paper shop and notice the aperture in the wall to the side used to allow a projector beam to pass through. Colerne's equivalent to 'Cinema Paradiso' back in the old days! There is also a play area within the village. If you want more information on some points, just send an enquiry. If you want to visit Bath you could go and see the new shiny shopping mall and enjoy the chain eateries or make use of the 'Bath Rewards Card' you will be supplied with that offers discounts on independent eating places and tourist attractions. I cant put a link here but if you search for BIGHA and find Bath Rewards card you will have more details. eg you can swim in the famous Bath hot mineral water and get 3 hours for the price of 2 midweek at Bath Therma Spa. You could also take advantage of our cheap rates if you book midweek. I would also recommend going on the Bath Frankenstein tour to find out what Bath was like when struggling authors like the Shelley's and Dickens frequented it. People have used the house and quiet gardens as a backdrop for videoed events, as it could be for your special event. The two local pubs both offer food and one can offer outside catering. Guests may be interested to use the two local pubs for Hen nights and other parties. They can be found on Facebook. The Fox and Hounds and The Six Bells. Trimnells offers guests the chance to enjoy village life in a designated area of outstanding natural beauty. They can walk to country pubs in a friendly unspoiled village just off the tourist track where visitors of all kinds are welcomed including many overseas visitors who have described Colerne as "a bit of old England". We think by this they mean that locals will greet you and talk in the street and pubs. Local facilities include golf, clay pidgeon shooting, quad bikes, go karts etc. There is also a play area within the village. Guests who have enjoyed Trimnells House and gardens the most have been families and other groups who seem to enjoy the peaceful walled gardens where children can play while adults can eat and drink. Another group has been Londoners, who seem to enjoy the contrast and leave with batteries recharged. Last but not least. Families with children have particularly enjoyed staying at Trimnells. Children seem very excited when they arrive. Perhaps its the imposing and slightly 'Hogwarts' exterior of the house which they explore energetically before moving on to the walled garden with its fish pond, fruit trees and chicken run where they find our chickens living in a children's playhouse converted into a chicken house. Our hens (~20-25) are rescue hens from battery units who enjoy virtual freedom in a large run to the side of the house. Children can feed the chickens and collect the eggs and seem to enjoy just watching them. (They are like little dinosaurs strutting around complete with the odd fight)! We have also had alternative health seminars reviewed here that have used the house and quiet gardens as a backdrop for videoed events, as it could be for your special event. The two local pubs both offer food and one can offer outside catering. Guests may be interested to use the two local pubs for Hen nights and other parties. They can be found on Facebook. The Fox and Hounds and The Six Bells. Trimnells offers large rooms (~20-30 sq mtrs) with en suites. Large off street car park. A quiet, safe location away from main roads but not far from major airports and the M4. Bath is a 20-30 minute drive to the center. We offer disabled facilities including a ground floor bedroom with level access shower. The accommodation is on the ground and first floor. The side annex and top floor are separate from the rest of the house including a seperate staircase and door. Noise is not a problem in a detached house if you want to party, and there will be no noise from other parts of the house if you want quiet. Trimnells House, Colerne, near Bath, is ideally placed for combining the enjoyment of rural South West England with the delights of exploring the areas’ rich and varied history. Both Georgian Bath and access to The Cotswold Way are only 5 miles away. Situated only 15 minutes drive from the M4 we are also within easy reach of Bristol & Swindon (within 30 minutes) and Cardiff & Cheltenham (within 1 hour). The international airports of Bristol, Cardiff, Birmingham & Heathrow are all less than an hour and a half away. Hi I grew up in Bath. I purchased Trimnells House and moved to Colerne in 1991. I nursed until 2009, since when I have been offering guest accommodation. I do enjoy eating out and live music. I also enjoy seeing visitors have a memorable stay at Trimnells House. I have lots of information about the local area so please ask if you need anything. This property is imposing and is visually pleasing.The rooms airy and spacious. The village is traditional,thriving and friendly. Offering this property enables me to share this experience with others. If you are a stag/hen party Trimnells offers a good environment to have a party, make a little noise, have a barbecue, make use of the garden for games. You can take a short walk to pubs that can look after large groups particularly if you make prior arrangements arrangements and book tables. Further afield are the nightclubs of Bath and Bristol. Why not take the plunge like a Roman and swim in the hot spring water at Bath Thermae Spa? If you are a family group. Families with children have particularly enjoyed staying at Trimnells. Children seem very excited when they arrive. Perhaps its the imposing and slightly 'Hogwarts' exterior of the house which they explore energetically before moving on to the walled garden with its fish pond, fruit trees and chicken run where they find our chickens living in a children's playhouse converted into a chicken house. Our hens (~20-25) are rescue hens from battery units who enjoy virtual freedom in a large run to the side of the house. Children can feed the chickens and collect the eggs and seem to enjoy just watching them. (They are like little dinosaurs strutting around complete with the odd fight)! We are about 6 miles away from Castle Combe used for 'War Horse' and 'Stardust' movies. We are also about 6 miles from Lacock used in the 'Harry Potter' movies including Harry Potters classroom and his parents house. Further afield can be found Stonehenge, Avebury stone circle and Longleat. If they go to the Roman Baths they can walk where the Romans walked and there are some good hologram effects to give you an idea of what it was like. If you take the kids to the viewing point at the top of nearby Tog Hill they can see across Bristol and the Severn Estuary as far as the Brecon Beacons on a clear day. (Binoculars recommended). The best features about this property include the peace and quiet of the enclosed gardens and surrounding area. The architecture of the property which never fail to impress. Other benefits include:- Ample off street parking. Groups often arrive from different directions in many cars. Parking can be difficult in Bath. Stags/Hens or families may want to be at the hub of many interesting attractions. 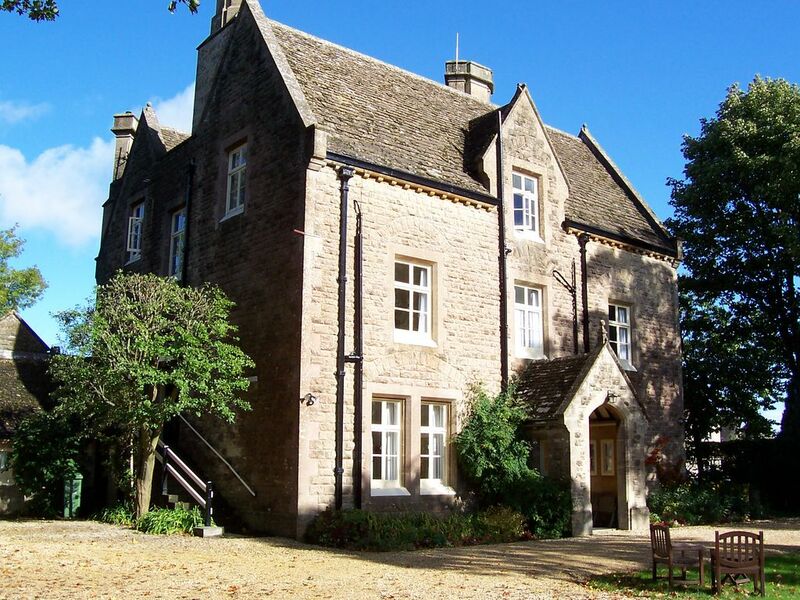 Guests will be within 7 miles of Bath, Castle Combe and Lacock. These last two villages are featured in movies and TV and are an attraction in their own right and quickly reached from Colerne. Guests will be able to enjoy country pubs in a small but vibrant village location far different from the towns or countries many come from. Guests who intend to visit Bath whose journey involves the M4 will find we are ideally placed as a destination, before they complete the last few miles of their journey into Bath. toilet, shower, Bedroom 1.Level access shower.Shower seat available . toilet, shower, Bathroom 2 is the en suite to room 2.
toilet, shower, This is the en suite to bedroom 4.
toilet, There is a separate toilet on the ground floor. toilet, There is a separate toilet on the first floor. There are 4 en suites. There is a separate toilet on the ground floor and another on the first floor. Available to the side of the house in a separate area.On request. There is a ornamental only Victorian fireplace in the lounge. Additional electric fire in dining room. Full kitchen Plenty of glasses,china cutlery,chefs knives. Full range of pans,cookware. Food processor,slow cooker,scales. Kettles and large urn. The dining room is ground floor front and it has a drinks chiller and ice maker. Lots of local information books.Some childrens books. There is a mini multi game table available. (snooker,ping pong,table football Casino table. There are boat trips available on River Avon and the Kennet and Avon canal. There are local golf courses. There are wide doors Room 1 level access shower, level access a shower stool available on request. A ramp is available for the step up to the front door. Smoking is allowed in the gardens and front porch. There is a a trampoline, fenced off fishpond, barbecue and a chicken run in the garden. We had a fantastic stay at Trimnells House. It was the perfect size for our hen party with great facilities. Sue was very friendly and good communication throughout. House was very well equipped. Very child friendly lovely and warm. Beautiful area. Sue, the owner, is very nice. Beautiful house in picturesque village only a short drive from Bath. Great for large groups of friends / family. Large bedrooms with en-suite in every room & sizeable garden with BBQ. Thank you for your review Rebecca.Glad all you lovely ladies enjoyed your stay. Great house for a large family stay. The owner was really accommodating arranging the beds for our family. Great kitchen with every appliance you could need. Informal garden so great for the children to play in. Overall a lovely stay. Thank you for your review.So glad you enjoyed your stay.The children were delightful and particularly seemed to enjoy the chickens we keep. We were a group of 13 for a hen do and had the best time at Trimnells House. All of the rooms were comfortable with en suite bathrooms. The garden is lovely - much bigger than the photos led me to believe. Sue was incredibly accommodating and helped us organise getting a hot tub delivered and set up in the garden - she was happy to deal with delivery and pick up at no extra cost. I would definitely stay again. Dear Grace,thank you for your review.First time we have hired a hot tub,it worked well . Our guests often visit Lacock for the Abbey, Museum of Photography and Harry potter film location. They also visit Castle Combe a picturesque village used in the films Warhorse and Stardust. They also visit nearby Roman Bath. Bank holiday Sundays 2017 charged at weekend rate of £699 per night 16th April , 30th April , 28th May , 27th August . Also 24th December .